Retroviruses are a unique class of single-stranded ribonucleic acid (RNA) containing viruses, which replicate their genome through a double-stranded viral deoxyribonucleic acid (DNA) intermediate in the nucleus of the host cell. This is in contrast to all other RNA-containing viruses that replicate their genomes through double-stranded RNA intermediates almost always in the cytoplasm of host cells. Most retroviruses contain an RNA genome of 9 to 10 kilobases in length, which encodes a minimum of three genes required for replication. These are referred to as gag (structural proteins of the virus), pol (enzymes involved in replication), and env (envelope glycoproteins required for the virus to attach to a receptor of a new host cell). Human immunodeficiency virus (HIV), which causes acquired immunodeficiency syndrome (AIDS), belongs to a subclass of retroviruses, the lentiviruses, which encode additional viral genes that permit the virus to grow in nondividing cells, such as white blood cells. 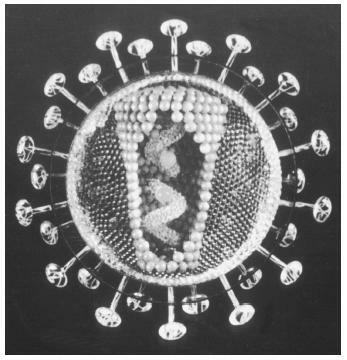 Model of the human immunodeficiency virus (HIV). RNA is enclosed within proteins, surrounded by membrane and glycoproteins. called integrase (IN). Since there is no matching sequence between the viral DNA and the host genomic DNA, sites of insertion are mostly randomly distributed. Because the viral DNA is now part of the cellular chromosome , it is duplicated whenever the cell's own DNA is replicated. Transcription of the viral sequence from the integrated DNA to make messenger RNA (mRNA) requires cellular enzymes. Full-length viral mRNA is transported to the cytoplasm where it is either packaged into progeny virus or translated on non-membrane-bound (free) ribosomes to yield viral Gag and Gag-Pol polyproteins (assemblies of many similar proteins). These polyproteins in turn migrate to the cell membrane where they assemble into virus particles, containing RNA, which bud from the cell surface. Concomitantly, viral glycoproteins are translated as polyproteins from a smaller-sized, spliced viral mRNA on membrane-bound ribosomes. These polyproteins are processed in the endoplasmic reticulum , where they also go through an additional modification known as glycosylation, in which sugar groups are added to the protein. When virus particles bud from the cell, they pinch off a portion of the cell membrane, containing the viral glycoproteins. This membrane becomes an outer coating of the virus particle. The Gag and Gag-Pol polyproteins are cleaved into the mature-sized proteins during or immediately after the budding process by a third viralencoded enzyme called protease (PR). Once the protein-cleaving proteolytic processing is complete, an infectious virus results, which can infect new cells. During an active infection process, approximately 1 percent of a cell's resources are diverted to synthesis of virus genomes and proteins. Infected cells are therefore not killed. Most retroviruses activate expression of a cancer-causing gene, called an "oncogene," which transforms host cells so that they become immortalized, providing a long-term home for the retrovirus. Lentiviruses, including HIV, do not transform cells. Instead they cause cell death in some of the cell types in which they replicate. When these cells are important components of the immune system, an infected person loses the ability to mount an effective immune response, resulting in AIDS. This leaves the person susceptible to almost any opportunistic infection. Patients with HIV infection are treated with drugs that inhibit either RT or PR to slow the spread of virus. As of May 2001, the treatment of choice for HIV patients included two RT inhibitors and one PR inhibitor, and is known therefore as "triple therapy." These drugs do not cure AIDS because the viral genome is integrated into the host chromosome. Also, virus-containing drug-resistant enzymes can be rapidly selected in a treated patient, necessitating the need for multidrug clinical strategies. Thus the only sure defense against AIDS is not to become infected by the virus. Gallo, Robert. Virus Hunting: AIDS, Cancer, and the Human Retrovirus. Vancouver, WA: Vintage Books, 1991. ——, and Gilbert Jay. The Human Retrovirus. San Diego, CA: Academic Press, 1991.